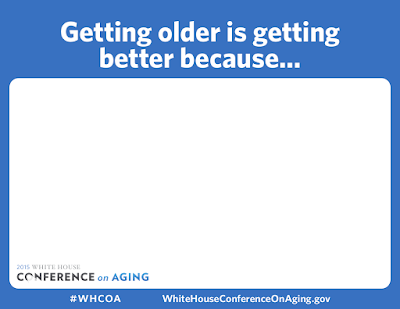 The White House Conference on Aging will be held on July 13th, 2015. This year, we, Americans, celebrate the 50th anniversary of Medicare, Medicaid, and the Older Americans Act, in addition, the 80th anniversary of Social Security. The White House Conference on Aging is a celebration of these key programs as well as looking forward to the issues and challenges that face older Americans for the next decade. Being healthcare practitioners, the Acupuncture and TCM community can participate in the larger discussions on aging in America. You have a unique perspective on how aging affects your patients and how Acupuncture helps them. Share how the conference is important to you and your thoughts and insights on aging from a practitioners perspective. Interview and share the story of your older patients and how acupuncture has helped them. Use the StoryCorps app to record and share your interviews. Gather a group of your colleges together and make an event out of it. Here's a PDF that's provided to guide discussions and posting to social media. Tweet your questions with the hashtag #WHCOA and follow the @WHAging Twitter account. Download and print out the PDF and finish the sentence, "Getting older is getting better because..." Send it out on Twitter using the hashtag #WHCOA. As a healthcare practitioner, you can also share experiences directly with the White House at their email address.